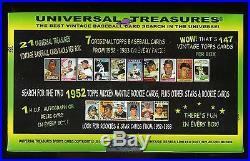 UP FOR SALE IS A LIMITED EDITION UNIVERSAL TREASURES BASEBALL BOX. THIS IS ABSOLUTELY THE BEST CHASE BOX ON THE MARKET!! EACH BOX IS INDIVIDUALLY NUMBERED TO 25,000. THIS IS A FACTORY SEALED BOX. STRAIGHT FROM A FACTORY SEALED CASE! 21 UNIVERSAL TREASURES VINTAGE PACKS! 7 VINTAGE TOPPS CARDS PER PACK. (RANDOM TOPPS BASEBALL CARDS FROM 1952 - 1983). ____________FIND MICKEY MANTLE CARDS FROM 1952 - 1969___________. Please use a desktop or laptop pc. P r i o r i t y M a i l. THIS IS BY FAR THE MOST EXCITING BASEBALL CARD CHASE BOX ON THE MARKET TODAY! Here's what some Ebayer's have already found in these packs! Hank Aaron, Pete Rose and many others found. AAA+++, Thank you for the nolan ryan rookie card.. Autograph or Relic card per box. UNIVERSAL TREASURES HAS ACQUIRED TWO 1952 TOPPS BASEBALL CARD SETS. IN ADDITION HAS ACQUIRED THOUSANDS OF TOPPS BASEBALL CARD SETS FROM 1953 - 1983 AND HAS INSERTED THESE SETS INTO 7 CARD PACKS. FIND 1 OR BOTH OF THE 2 MICKEY MANTLE 1952 TOPPS ROOKIE CARDS! THERE IS 2 OF EVERY PLAYER FROM THE 1952 TOPPS SETS (RANDOMLY INSERTED). ALSO FIND STARS AND ROOKIES FROM 1953 - 1983. YOU CAN FIND ANY TOPPS BASEBALL PLAYER FROM 1952 - 1983. FIND A MICKEY MANTLE ROOKIE! WILLIE MAYS ROOKIE, HANK AARON ROOKIE, ROBERTO CLEMENTE ROOKIE, PETE ROSE ROOKIE, NOLAN RYAN ROOKIE, REGGIE JACKSON ROOKIE, THURMAN MUNSON ROOKIE, GEORGE BRETT ROOKIE, OZZIE SMITH ROOKIE, RICKEY HENDERSON ROOKIE AND MANY OTHER STARS AND ROOKIE CARDS! OPEN A UNIVERSAL TREASURES VINTAGE BASEBALL CARD PACK AND IT MAY CONTAIN. A GEM MINT STAR PLAYER OR ROOKIE CARD. MANTLE, MAYS, AARON, CLEMENTE, RYAN, JACKSON, BRETT, MUNSON, ROSE, EDDIE MATHEWS, DRYSDALE, PAFKO, BERRA, KALINE, EDDIE MURRAY, OZZIE SMITH, ANDRE DAWSON, GARY CARTER, ROBIN YOUNT, RICKEY HENDERSON CAL RIPKEN JR. PLUS FIND A HALL OF FAMER AUTOGRAPH OR RELIC CARD IN EVERY BOX! BABE RUTH , JOE DIMAGGIO, MICKEY MANTLE, WILLIE MAYS, HANK AARON, NOLAN RYAN, REGGIE JACKSON. AND MANY MORE GREAT STARS! Buyers have already pulled great vintage STARS AND ROOKIE CARDS from these boxes. THIS IS ABSOLUTELY THE BEST VINTAGE BASEBALL CARD SEARCH BOX ON THE MARKET! GET YOURS BEFORE THEY'RE ALL GONE! Possible Gem Mint card finds from Universal Treasures Vintage packs. 1952 PEE WEE REESE 10,000. 1962 SANDY KOUFAX 9,050. 1952 JACKIE ROBINSON 34,750. 1969 REGGIE JACKSON 1970 THURMAN MUNSON. 1975 GEORGE BRETT 1976 DENNIS ECKERSLY. 1978 EDDIE MURRAY 1979 OZZIE SMITH. 1980 RICKEY HENDERSON 1982 CAL RIPKEN. 1983 TONY GWYNN 1983 RYNE SANDBERG. AND MANY MANY OTHER GREAT ROOKIE AND STAR CARDS. The item "HOT 21 PACK CHASE BOX 1950'S 1960'S 1970'S 1980S FIND 1952 TOPPS MICKEY MANTLE" is in sale since Tuesday, April 25, 2017. This item is in the category "Sports Mem, Cards & Fan Shop\Sports Trading Cards\Baseball Cards". The seller is "time-machine*2012" and is located in BASEBALLCITY. This item can be shipped to United States.